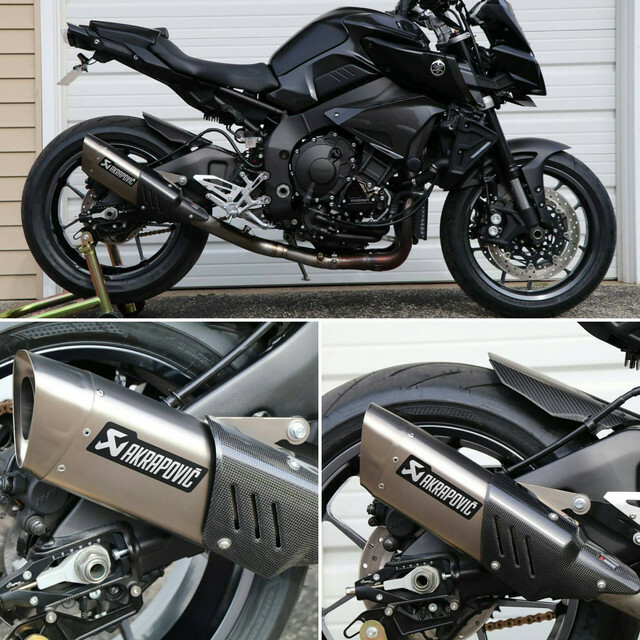 Here's the Akrapovic I just installed on my FZ. Sounds awesome, lot more throaty than the stock. Looks great man, those Akra's sound awesome. Nice! I wish Akrapovic offered the laser-etched logo versions in NA as well. How loud is it since you kept the stock muffler box? Yes, the laser etched looks nice on the MT version. Although I like the sticker too. Looks awesome, also curious if it increased the volume of the exhaust as well as making a nicer sound. Love my Akra 3/4 system!! Very satisfied with mine. The look is absolutely perfect for the FZ-10. Made a video today showing the sound of the Akrapovic 3/4 Titanium System on my FZ10. I wanted to make a clip that showed something other than the standard start and rev it that everyone posts. This is always the type of video I wanted to see when I was buying exhausts for bikes over the years. 1. Normal take off from a stop. 5. Accelerating using the quick shifter. ^^^ Good stuff, more meaningful than the standard static 'goosing the throttle'. Would be nice if someone did a baseline video with the standard stock setup. It is the Slip on and the Akra Titanium link pipe making it a 3/4 system. I also changed out the decal. I don't like the Zucchini can of the full system. The full system is also stainless headers and link pipe. I am also interested on the Akrapovics slip on, however I wanted to keep my cat since I don’t want the bike to be too loud. For those that installed the slip on without removing your cat, would you mind telling us how much louder it is than stock? Is there any change in loudness at all? I have been trying to find the dB measurement but haven’t been able to find any. Since this slip on does not have a removable baffle and since our stock exhaust is straight through design, is it safe to assume that it is not louder than the stock exhaust? 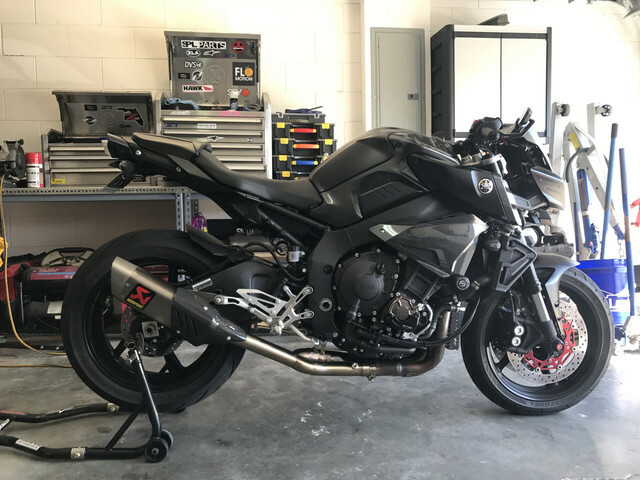 Heard another FZ-10 with just the Akrapovic slip-on. Pretty much sounds the same as stock. Maybe a little bit deeper sounding tone. Thanks. I wonder if there is other slip on that makes the sound a bit louder than stock. Most of the sound is killed in the cat, so if you want to keep that intact you won't get too much more sound, maybe a bit louder and change in tone. And you get the 'look' of the new exhaust. I'm never a fan of loud exhausts, most people naturally think louder is more horsepower and 'faster'. It's all in the imagination. And forget the 'loud pipes save lives' argument, that's an illusion to justify an obnoxious exhaust. Most slip ons are compliant with sound regs from California which is why they can't make them too much louder. When you remove the cat and put on a 3/4 system they technically aren't street legal and are sold for 'closed course use only'.....wink, wink. Anyone that would state loud pipes dont save lives has never ridden in a metropolitan area with a six lane highway. When I would be on loop 410 in San Antonio Tx. cagers would pull in to my lane all the time when I had stock exhaust on my shadow 1100. 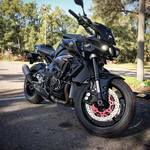 Once I put the aftermarket exhaust on this stopped happening, because the cagers could here me beside them. so if you say it doesnt work then you are living an illusion.